our new dining room table, finally here! "of the things I would want to hear from Jesus, 'Well done, good and faithful servant' is probably number one; 'Hey, nice shoes' doesn’t really even make the list"
--From a commenter at Lean Left in the midst of a debate about the song "The Christmas Shoes" in a post about the worst Christmas songs ever. I apologize for the poor photo quality. But what you're seeing is the drain for our washing machine. The black hose on the right comes from our machine, and was apparently duct taped to the drain. I never noticed until now, because it worked fine. This morning, I put a load of laundry in and went upstairs. Thankfully, I stayed in the kitchen, and I left the basement door open (yes, we finally have a basement door after three and a half months...but that's another long story), so when water started gushing a little while later, I heard it immediately. Who knows what might have happened if I'd been in another part of the house or closed the door. I ran downstairs and discovered that the duct tape connection had come loose, shooting a geyser of soapy water all over the wall and floor. Clearly duct tape does NOT fix everything. Since our basement is unfinished, it's not a big deal--though Steve is obviously at work and I don't want to leave the clothes sitting in soapy water all day long. I took the photos to send to him so he can tell me over the phone what to do. 1. My elbows are double jointed. Both of them, though the left is worse than the right. They bend out backwards, past 180 degrees, and I can twist my arms without moving my hand/wrist. I'll try to post a picture later today, or have Steve take one when he gets home or something. I have found that this body quirk elicits two reactions: "COOL!" or "GROSS!" 2. I make a lot of noise when I first wake up--sort of a mild protest against getting out of bed, I guess, complete with groaning and moaning. A lot of the time I don't even realize I'm doing it. I also make funny noises when I yawn--I get that from my mom. I think I used to do it to mock her and it sort of stuck--kind of like how your parents tell you not to cross your eyes because they'll stay that way. 3. I save everything school-related. I still have papers I wrote in sixth grade, four years of French vocabulary sheets, my entire anatomy notebook from my junior year of high school...and the sick thing is, I know exactly where it all is. I hate to throw it away--keep thinking, "you never know when that might come in handy." And in fact it does occasionally: While I was home last weekend we were talking about family tree stuff and I was able to produce, in under 60 seconds, a genealogy paper I wrote in 1998. So there. 4. I am picky about food textures. There are a lot of foods I don't care for solely because of how they feel. This includes beans (every kind but green) as well as yogurt/pudding and other creamy/substanceless stuff. 5. I have been known to talk in my sleep. Usually it's incoherent mumbling, but occasionally it's clear. One instance that comes to mind is from high school...a friend heard me and thought I was still awake. When she responded, "What? ", I said loudly, "The diamonds! The diamonds are dripping!" 6. I can recite the 50 states in alphabetical order at an astounding rate. We learned a little song in third grade and I took great pride in being the first one to have them memorized. I used to be able to fly through them in under 20 seconds--not sure if I can still go that fast or not. Just one of my many useless talents. Let's see, who to tag next? How about Julie, Jeff (I already know he's weird, can't wait to see what he would come up with ;), Amanda, Kate, Micah, and Josh/Jamie (whoever gets to it first over at their place). Of course, some of these will be party poopers--so join in even if I didn't tag you, and leave a comment to let me know you're sharing your oddities with the world. This is one of those posts where I'm dropping in to say, I'm so close to finishing NaBloPoMo and don't want to drop the ball now, but I don't really have much to post. Actually, that isn't true. I have plenty of post ideas...but have been too lazy to develop them today. Make of that what you will. Really, though, I know my blog traffic was way down over the holiday weekend--so rather than inundate you with more posts, I'll just encourage you to go back and read some of the things I wrote over the last few days. And feel free to add your two cents in the comments! “Do not be wise in your own eyes; fear the Lord and shun evil” (Proverbs 3:7). Josh Harris blogged last week about what it means to be wise in your own eyes. A few personal suggestions he offered: "I am wise in my own eyes..."
"When I don’t pause to pray for God’s guidance on a decision." "When I fail to depend on God’s word and approach it as a daily 'lamp to my feet and a light to my path' (Ps. 119:105)." "When I am critical of another person’s practice or perspective without taking the time to understand it and ask questions." "When I am lax in fleeing temptation, assuming that I’m adult enough to 'handle it.'" "When I do something right and fail to acknowledge before God that it is only his grace that allowed me to do it right." "When I pat myself on the back about knowledge I have that I learned from someone else." "When I don’t draw out, or seek to understand, a person who is bringing criticism (whether or not it’s being brought constructively)." "When I assume that the truth of a sermon is for someone else, not my own life." Until I see God and fear him, I cannot see myself rightly. When my view of him is clouded, when I’m a functional atheist, I will trust and applaud my own wisdom. But when I rightly fear God—when I see him for who he is as the all-seeing, all-powerful Holy One to whom I will answer—I will see myself as weak, dependent, and in need of heavenly wisdom. When I fear God, I will shun the evil of pride and self-sufficiency. As I study the fear of the LORD and continue to battle pride in my own heart, this verse, and this post, strike a nerve in me. It's that whole issue of what I say I believe versus what I live like I believe--too often, not the same. I would certainly affirm that God is omnipotent, sovereign, the only wise God. But how often the choices I make proclaim that I believe I am sovereign and all-knowing. How do I proclaim this? I pray that God will give me the grace to trust and applaud His wisdom, not my own--to humbly fear Him and shun self-exaltation. Last week, the Christian blogosphere was buzzing about an article in Relevant Magazine called "The Dreaded Church Table." Author Daniel Holland writes about the way restaurant servers argue about who has to wait on the Christians--who are notorious for terrible tipping. What a sad testimony to our lack of generosity. You may have arguments about whether tithing is binding on Christians who are no longer under the law...fine, take them elsewhere. That's beside the point here, so don't leave comments about it. You're right, we're no longer bound by the law--but as we realize that God gave His only Son to redeem us from the law, shouldn't that motivate us to give MORE than the law requires, not less? Eric Schumacher at An Infant in a Cradle preached a sermon on November 12 in honor of the International Day of Prayer for the Persecuted Church. As a preface, he noted: "It is important that we hear these stories. However, hearing them is not enough. We are called to respond. So, I want to ask this question...: How do we respond to the persecuted church?" Schumacher posts his sermons online, but I know you won't go over there and read the whole thing (it's long). So, in light of the fact that I'm now on the VOM blogroll and trying to blog regularly about the persecuted church, I think I'll break down his "ten responses to the persecuted church" over the next several weeks, listing his suggestions and adding my thoughts. 1. "Do not be surprised by them." "Beware of men, for they will deliver you over to courts and flog you in their synagogues, and you will be dragged before governors and kings for my sake, to bear witness before them and the Gentiles. …Brother will deliver brother over to death, and the father his child, and children will rise against parents and have them put to death, and you will be hated by all for my name's sake. But the one who endures to the end will be saved" (Matthew 10:17-25). "They will put you out of the synagogues. Indeed, the hour is coming when whoever kills you will think he is offering service to God" (John 16:2). Schumacher offers several other references to remind us that suffering was what we were told to expect all along, including 2 Timothy 3:12; 1 Peter 4:12; and 1 John 3:13. Should we grieve that our brothers and sisters face suffering and even death because they claim the name of Christ? Of course. But it shouldn't surprise us. These trials are ones Christ Himself assured us would come--and promised us would be used for His glory and our good. knowing that although I likely will never meet them on earth, we'll get together in Heaven someday! did I mention my amazing husband? "Faith is thankfulness for goodness put on hold." As I read those words again recently, I was struck by the irony, the promise, the prayer that their evil cry contains. Christ's blood is on us--not just the Jews who called for His death, but each of us who sins, who chooses again and again to glorify himself instead of his Creator. The only reason Jesus had to die was because we were sinners. So His blood is on our hands--the cross renders a "GUILTY!" verdict for every one of us. And yet...to those who believe, the words contain a promise: His blood be on us. Because Christ died, we can be reconciled to the Holy God. "without the shedding of blood there is no forgiveness" (Hebrews 9:22)--but "by means of His own blood," shed on the cross for us, "he entered once for all into the holy places, not by means of the blood of goats and calves but by means of his own blood, thus securing an eternal redemption. ...Therefore he is the mediator of a new covenant, so that those who are called may receive the promised eternal inheritance, since a death has occurred that redeems them from the transgressions committed under the first covenant" (Hebrews 9:12,15). If we trust Him to save us--if we place our faith in His righteousness and not our own merit--His blood is on us. "It was not with perishable things such as silver or gold that [we] were redeemed from the empty way of life...but with the precious blood of Christ, a lamb without blemish or defect" (1 Peter 1:18-19). And so the angry cry of those who called for His crucifixion becomes our humble plea. We have no hope, no claim before God other than, "Let His blood be on us!" And when this is our plea, our shame and guilt are covered by His perfect obedience and sinless death. His righteousness is ours. Because we are sinners, His blood is on us. Yet because we trust Him to save us, His blood is on us. What a merciful God we serve! I generally have a pretty firm "no Christmas music until after Thanksgiving" rule. But I broke it this year. Savior: Celebrating the Mystery of God Become Man has been on continual repeat in my car since I received it a couple of weeks ago. When I first downloaded the free single Sovereign Grace Ministries put out to promote their new Christmas CD, I immediately pre-ordered a copy of the whole CD. After my other two CDs, I'm hooked--so I couldn't wait to hear an entire album of gospel-centered, Christ-exalting Christmas music. As the website explains, "Each of the twelve new songs is a celebration of this amazing truth: The baby in a manger is God himself, the Savior who came to bear our sins and bring us close to the Father." You won't find any reindeer games or sleigh rides or frightful weather and crackling fireplaces here. Not that those things are bad--they're blessings from God. But they aren't the main thing. They're fun traditions, but they aren't the reason we celebrate every December. This CD focuses on the wonder of the incarnation, the incredible miracle of God coming to earth--"Endless Ages wrapped in years," as one song puts it. Songwriter Mark Altrogge explains that the goal was to create "not just Christmas songs, but Christmas songs that could be used in worship"--Christmas songs with actual content, songs that magnify God. --"Christ the Lord is Born Today"
Other favorites (though they're all great) include "Rejoice," a triumphant song which tells the story of God's goodness and majesty through three verses on creation, redemption and Christ's final return in glory; and "Wonderful Counselor," which puts beautiful music to one of my favorite Christmas passages, Isaiah 9. Often when we think Christmas music," certain songs immediately come to mind: "Silent Night," "Joy to the World," etc. So with twelve brand-new songs on this CD, what makes it "Christmas-y"? Besides the lyrics, what makes Christmas music have that holiday feel? I can't pinpoint it, but these songs do have a warm "Christmas feel." I don't know if it's certain instrumentation or what, but they completely succeed in getting me excited about Christmas--and in this case, for all the right reasons. And yet, the rich gospel content makes it a year-round CD. I definitely won't be able to put it away in January! Our Creator became a man like us! Can we ever fully comprehend that truth and what it means? No--but Savior: Celebrating the Mystery of God Become Man is a great way to deepen our understanding and our joy as we exult in this truth. Go buy this CD! take Operation Christmas Child shoeboxes to collection center...walk Hank...return movie...make cake (freeze other half? )...make card/buy one?...prayer service tonight...Hank needs a bath...clean oven--what was causing all that smoke?...call doctor...de-clutter in kitchen...also desk in office...fold laundry...put load in dryer...blog ahead for this weekend at home...returns at Dollar General...Pam's birthday next week...pumpkin bread...Christmas lists...buy more broccoli(? )...materials to Sandra...cell phone with me at all times tomorrow...early shower...take Hank for car rides...weather this weekend? take warm coat...get Christmas ornament at home...use up rest of meat in fridge before we leave...search for sermons and burn CDs for Steve...rake patio...work on 1 Corinthians 15...get off computer and start crossing some of these things off! Why I do Thankful Thursday, and try to thank God as much as possible in between. Holiday Grinch: What's Your Ideal Thanksgiving? *I've never had cornbread stuffing. I guess that means I will never be a real Southerner :) TURKEY: Fresh or Frozen? *either way, if it's smoked. I'm not a big fan of the regular roasted kind. BEVERAGE: Sweet Tea or Champagne? *yuck (again, will never be a real Southerner) and yuck. how about a glass of milk--or some apple cider? CASSEROLE: Green Bean or Squash? AT TABLE: Friends or Family? TABLETOP: Good China or Chinet? ON TV: Macy's Parade or Football? JELLO SALAD: Tradition or Unforgiveable? AFTER DINNER: Pants Undone or Out for a Walk? Countdown: Three days until we're home giving thanks with family and friends! It's a good-natured family rivalry now (me versus my dad, mom and brother); maturity, plus years of losses to Michigan under Jim Cooper, taught me not to talk too much trash because I'd likely end up eating my words. Still, I won't be able to resist at least a little "Go Bucks!" when I talk to my parents tomorrow night. I suppose I am a bit of an anomaly as a wife--the kind who doesn't just not resent it when her husband watches football, but actually looks forward to curling up on the couch with him to catch a game. This maybe started also because I am a daddy's girl; my dad used to be an assistant football coach (before I was born) and I loved asking him questions, learning all the lingo. I take pride now in being able to follow the plays, knowing who plays what position and what the calls mean. So as you can imagine, all activities at the Kannel house stopped for Buckeye football this afternoon. The game was unprecedented in the history of the Ohio State-Michigan rivalry as a #1 vs. #2 matchup--and our Buckeyes came out on top. Steve heard a rumor recently that NFL teams are courting our beloved Jim Tressel. Who can blame them? He's a phenomenal coach--now 5-1 against Michigan, with one national championship under his belt and another on the way. Steve remarked the other day that he probably never buys his own dinner if he eats out anywhere in Columbus. The man is incredible. If he leaves OSU to go coach a bunch of overpaid whiners, we will cry. I posted earlier this week about the International Day of Prayer for the Persecuted Church. I want to try to make posting about the persecuted church a more regular thing, because I know it's all too easy for me to move on and let the suffering of my brothers and sisters around the world drop off my radar screen. Out of sight, out of mind and all that. But God doesn't leave forgetting about them as an option open to me--so I'm writing to keep it at the forefront of my own mind, and perhaps yours, too. We all know the first thing we can do for persecuted Christians is pray. We say it's important, but do we mean it? Do we do it? As PersecutedChurch.org said, "The most we can do is the least we can do — pray." We can make a difference in the lives of persecuted Christians around the world because we have the privilege of interceding for them before the throne of our sovereign and loving Father. And we don't have to settle for praying generic prayers like, "Lord, please help them." Nor do we need to pray, "Lord, be with them" (it's an unnecessary prayer for Christians--He already is). In this Internet age, information about their struggles is at our fingertips. We have access to tons of stories and testimonies; we can receive free updates from organizations like The Voice of the Martyrs who can suggest helpful direction for our prayers. Of course God hears our generic prayers, and of course He knows better than we do what the persecuted church really needs. But knowing specific things to pray about can be beneficial in so many ways, as Mark Lauterbach explains here. Don't you feel more motivated to pray--doesn't your prayer life seem more vibrant and meaningful--when you know what to pray for? Or to put it another way: Would you rather have someone pray, "Lord, please help her and bless her" or would it mean more if they prayed for specific help in ways applicable to your particular situation? I know which I'd rather have. To go deeper, check out these Critical Prayer Requests for Strategic Nations--which includes more specific requests for governments and churches in restricted/hostile nations from Afghanistan to Egypt to Vietnam. You can also check out VOM's Persecution Blog for regular updates and prayer needs. It is an eerie thing to hear the sirens come to a screeching halt outside your front door; scarier still to look out your kitchen window and see flames erupting from the window of the house next door, to smell the acrid smoke with all doors closed and windows shut. Fire trucks, other fire department vehicles, city utility and EMS vehicles are parked haphazardly all along the street out front. Several people were standing in the backyard a while ago, watching in disbelief. I went out to offer my help--a place to get out of the rain, a phone, whatever--but it wasn't needed, at least at this point. I didn't want to stand outside and gawk rudely; I had no other reason to be out there. No one was hurt; the house is split up into three or four apartments and only one person was home at the time--the one who smelled smoke and called 911. The window where I saw someone inside remodeling yesterday is now blackened. The house was an eyesore before; I wonder if it will be salvaged. The danger is past; the owner/landlady is gone and the tenants standing in the backyard have dispersed. They likely are now homeless, at least temporarily. I hope they have family or friends to go to. I feel as though I want to help, but don't know how. The house is close enough to string a tin-can telephone or a clothesline between that window and ours; I would have worried if ours weren't brick. If it had been a dry day, our fence might have burned. The entire backyard is hazy now. I stand at the window, compelled to watch, thinking that the reflective stripes on the firefighters' uniforms really do work--all I can see through the black hole of the window are patches of muted fluorescent yellow. From my vantage point, it seems obvious this is where the fire started, where the flames were shooting out. The paint next to the window is discolored, bubbled up crispy; the screen hangs in shreds. The window frame is clearly charred; a few fragments of glass hanging at the top are all that's left. Two firefighters use a long yellow pole to bang at the wall on the other side of the peeling exterior paint. From what my brother has explained to me, I'm guessing that they're looking for the weakest, most damaged spot, to pinpoint the fire's origin. Wiring in the wall, perhaps? Old houses are especially vulnerable to faulty wiring, and this gives me pause. All flames are out now; after a breather in the backyard, the firefighters are back in that room at work. I watch one unscrew a bottle of orange Gatorade, settling in for a long morning. They put their helmets back on and begin cleanup, dragging charred pieces of plywood out the back door. As I watch them work, I can't stop thinking of my little brother. I feel intense pride (and a little trepidation) at the thought that this is Josh's line of work, his passion. Halfway through, and still going strong. I don't think a link to someone else's brilliance counts as a real post...but that's all you get for today because I spent my time thinking through and writing through two other posts on blogs that remain, at least for now, private. Wisdom in time management dictates that I not spend any more time blogging today...but I did write on a blog today, which is (I believe) the spirit of NaBloPoMo. Can I obey the spirit of the law and not the letter? "Burying my resume in the presence of Christ"
...there is in me a desire to receive some glory at the end of life --to have folks list my work and accomplishments, to remember my industry and achievements. I would not have disclaimed them as did Rutherford, I would have savored them. more fruitful, and wonder if I am significant or not. Are my works bringing me honor? “How do you know you’ve had an encounter with God? Here’s how you know you’ve really met God: You limp. I listened to this message by Keller last week and was blown away. All of it is excellent--worth a listen--but this quote at the end made me get up and pause it so I could copy every word. I felt like God in His kindness was giving me one more puzzle piece, bringing more of the big picture into focus. "WHY" is the obvious question we ask when we go through trials. We usually can't see at the time; we learn to trust that God is using them for our good and His glory. Sometimes He gives us answers later; other times, we never see (this side of heaven) what He was doing. As I heard these words from Keller, it seemed to me that God was graciously shedding light on the dark desert He took me through in late 2004-early 2005. Since coming out of that, I have been able to say that I can see He had purpose in it. But when I heard this quote, I actually felt praise welling up within me for that miserable time. I saw so clearly how I had to go through that in order to be able to understand the centrality of the cross--the gospel-centered perspective He has been driving deep into my heart over the last year. God used that dark time to break me. He broke me so that He could expose the self-righteousness and pride in my heart. He broke me so that He could rebuild me deep within, centered on the glorious gospel of grace. How thankful I am that He brought me down so that He could use me. How I pray that He'll continue to drive those truths deep into my heart and use me to point others to the cross. For those of you who participated in Operation Christmas Child, Samaritan's Purse has a blog up called Follow the Box--a fun way to see the journey your shoebox takes to reach a child. Steve and I finished packing our boxes last night...the trunk of my car is full of boxes from our church, which I need to deliver to the collection site this week. We are close to meeting our goal of 50 boxes--a few more people are bringing boxes next Sunday so I think we will make it! I love this ministry! If you missed it this year, mark your calendar so you can participate next fall--National Collection Week is always the week before Thanksgiving. More than 70 million Christians have been martyred for their faith since 33 AD. But that suffering isn’t just something that used to happen a long time ago. This year an estimated 160,000 believers will die at the hands of their oppressors. Over 200 million Christians around the world will be persecuted, arrested, tortured, beaten or jailed. In many nations today it is illegal to own a Bible, share your faith, change your faith or allow children under 18 to attend a religious service. Today is the International Day of Prayer for the Persecuted Church—a global day of intercession for persecuted Christians worldwide. Its primary focus is the work of intercessory prayer and citizen action on behalf of persecuted communities of the Christian faith, as well as prayer for the souls of the oppressors, the nations that promote persecution, and those who ignore it. It’s an opportunity for us to join with Christians all over the world in praying for the suffering members of the body of Christ. Many times in the past, I have read books or articles about the persecuted church or heard speakers that inspire me to care for my persecuted brothers and sisters, and I am challenged and motivated to pray for them, to do something. But unfortunately it’s all too easy for me to gradually slip back into my comfortable life and not give any thought to the trials that the persecuted church faces. One reason I’m sharing with you today is because forgetting is not an option. God commands us in Hebrews 13:3—“Remember those who are in prison, as though in prison with them, and those who are mistreated, since you also are in the body.” So I’m taking this opportunity to remind myself of what Christians across the world face—and to challenge myself, and you, to care. To get involved. To obey God’s command to remember them because we also are in the body with them. Write a letter to a Christian in prison. By doing this, you provide a witness to imprisoned believers and to the authorities who may censor their letters. This encourages our persecuted family when they realize that they are not forgotten. You can also be an advocate by writing to government officials on behalf of suffering Christians—this can result in better treatment for the prisoners and provide a witness to the authorities. Send Action Packs to Pakistan, Afghanistan or Iraq, where they are gratefully received by persecuted believers as well as Muslim families and leaders who experience the love of Christ through this outreach. Send blankets to Sudan, where Christians are often on the run and the nights are cold. Mail New Testaments directly from your home into restricted nations. As of Friday morning, there were 59,440 recipients on the list waiting to receive a New Testament in their own language. Get informed--sign up to receive The Voice of the Martyrs' monthly newsletter or check out the Persecution Blog. Most importantly, we need to pray for our brothers and sisters. By themselves, our efforts are small—but infused with God’s Spirit, they have the power to change lives for eternity! We can make a difference in the lives of persecuted Christians around the world because we have the privilege of interceding for them before the throne of our sovereign and loving Father. Amy needs to either wake up or start getting some extra will-power. psycho amy needs help so plz HEEELLPPP MMEE!!!! Amy needs to be kept safe and nurtured by a foster carer. Amy needs a blueprint for her financial future. Give it a try by typing "[your name] needs" into Google...leave a link in the comments if you post this at your own site. = 1 very tired (and gurgly-stomached) Amy. Last night we had a GEMS lock-in, complete with great discussion and activities about our theme, games of Twister, makeovers and hairdos, movies and lots of laughs. 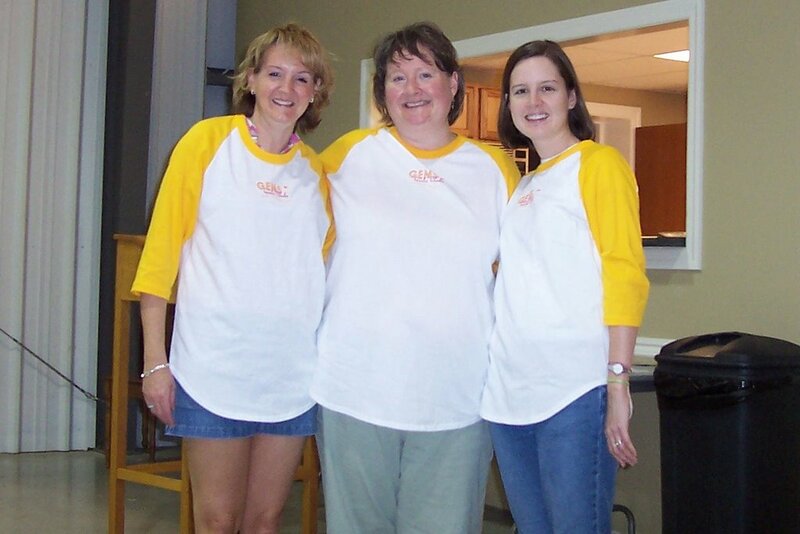 I adore those girls and my two fellow counselors--they are amazing women I am privileged to work with. So we had a blast...but I am just not up on the "let's stay up til 4 a.m." like I used to be. Ay yi yi. 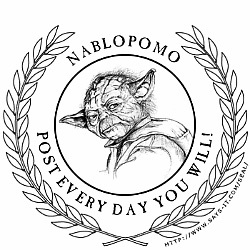 My NaBloPoMo commitment was challenged today, just ten days in. Why? I'm selfish and lazy--at least, that's the short answer. If you've talked to me at all in the last year, you've heard me say that my greatest challenge during this season of being a homemaker is time management--or lack thereof. Day after day, week after week, month after month...I come to the end of the day and feel discouraged, wondering where the hours went and knowing I didn't accomplish what needed to be done. Morning after morning (or unfortunately, afternoon after afternoon) I come to God again, asking for forgiveness for the same failures, asking Him to make this day different. Often the end of the week brings unnecessary stress because it's crunch time--there are things that absolutely have to be accomplished by the weekend, and because I squandered so much time early in the week, I have much to do in a short amount of time. Such was the case this week. Today I found myself with an overly ambitious list of to-dos because of all the hours I have wasted so far. I almost didn't have time to post, and probably shouldn't even be taking the time now. The fact is, I am selfish and lazy. There are plenty of hours in the day for me to accomplish what God sets before me, to minister to others and serve my husband. But I don't make choices that honor Him or Steve. Instead I make shortsighted, instant-gratification decisions. I worship idols of comfort and ease instead of magnifying my Savior. I hate this. "Sometimes we don't sense that we are experiencing His strength. Instead we experience deep, agonizing failure. ...Why doesn't the Holy Spirit always strengthen us? The answer may be one or more of several reasons. He may be letting us see the sinfulness of our own hearts. or He may be causing us to realize how weak we are in ourselves and how dependent on Him we really are. Perhaps He is curbing a tendency toward spiritual pride and causing us to grow in humility. Whatever the reason, which we may never know, our responsibility is to utterly depend on Him. He sovereignly and with infinite wisdom determines how best to respond to our dependence." My only hope is the gospel. I dare not trust my own righteousness, my ability to obey. I do not want to claim cheap grace, but when I have failed yet again, all I can do is cling to His promises in Christ: there is no condemnation for me because I am united to Christ. My standing before Him does not depend on my own performance, but on Christ's perfect obedience and sinless, sacrificial death in my place. His mercies are new every morning. And one day I will be forever set free from this body of sin and will serve Him perfectly. my new Christmas CD that arrived this week--LOVING it! go buy one! 70 degrees in November! whoo hoo! "If you, O LORD, kept a record of sins, O Lord, who could stand? But with you there is forgiveness; therefore you are feared" (Psalm 130:3-4). Why fear God? He is holy--if He kept a record of sins, no one would be able to stand. We would all be condemned. Surely that is reason to fear, right? But according to this passage, that's not why we fear Him. We fear Him because He forgives. How is this so? What does it mean to fear God because we find forgiveness with Him, and not because of His judgment? Perhaps part of it is that we stand in awe of such love and mercy. Fear based on His wrath and judgment would be a terrifying fear, not a comforting fear. But fear based on His forgiveness is a worshipful fear--amazed, speechless, humbled, grateful, adoring. It's a fear that hates the thought of dishonoring or displeasing One who loves me so recklessly, forgives me so completely. It's a fear that falls on its face at the foot of the cross, seeing that Christ knew wrath so that I could fear God because of forgiveness and not wrath. How could I reject Him? Perish the thought! That's the fear God desires from us. Some of you have maybe heard of NaNoWriMo--National Novel Writing Month. The idea is for people who have always wanted to write a novel to spend the month of November doing so--focusing on quantity, not quality, and just making themselves write what's in their heads. I'm terrible at fiction--just ask Dr. Mary Brown--so NaNoWriMo is definitely NOT for me. That's when I heard that someone came up with the alternative NaBloPoMo--National Blog Posting Month (language warning for that link, fyi). It's simple--just write on your blog every day. I tend to write in spurts. I find myself with lots to say one week, having to save posts for several days so as not to overwhelm you. Then the next week I have nothing interesting to write about and the blog is largely silent except for links to other people. For the month of November I'm trying to even things out--a post a day, all month long. Sorry I didn't get around to posting about it sooner--maybe some of y'all would have joined me! imagine that you could send a note via time travel to yourself five years ago. If there was enough space to write five short sentences, what would it say? One commenter had some good practical advice to his past self: "invest in Google." :) Reading through all the comments struck me as a kind of poetry. Five (or less) simple lines--vague and fascinating glimpses into others' lives. What would yours say? What would mine say? What wisdom would I love to impart to my college-sophomore self? I've been pondering it for the last several days, and I think my answer is: I wouldn't. Five years ago I was on-again, off-again in love with Steve (completely unbeknownst to him). Would I tell myself "be patient, he'll come around" or something to that effect? Certainly I begged God more than once to tell me--so that I could either "get over him and move on" or "relax in knowing it would happen eventually" (yeah right). But if I had known we would eventually be together, I am certain I would have screwed it up somehow, taking matters into my own hands in a Sarah-esque kind of way. Plus, as much as those months and years before Steve came around, and those early months when we first started dating, were awkward and confusing and scary (did I mention awkward? ), they were wonderfully so. I wouldn't trade the exciting journey-into-the-unknown with Steve for anything. So no, I don't think I'd tell myself anything along those lines. Then I thought, maybe I'd give myself a five-year head start on this cross centered life journey--direct myself to read a certain book or article that has helped me so much this last year, or listen to a sermon series, or tell myself to "run to the cross." But you know what? I think Tony is spot-on when he muses, "What's interesting is whether or not we would understand our notes to ourselves five years ago in the context of experience we write from today." God knew exactly what experiences I needed to go through, both wonderful and painful, and in which order, for me to learn what He's teaching me now. I can look back and see how He has orchestrated these lessons so beautifully--how He has arranged events and relationships and resources in the ways He knew would best drive His truth deep into my heart. And so the growth He has produced in me in the last five years could not have been jump-started. I wouldn't have been able to learn these lessons in 2001 because He hadn't perfectly prepared me for them at that point. In the end, all this pondering leads me to praise God for His sovereignty and His infinite wisdom. It leads me, strangely enough, to thank Him for not revealing the future to me. And it prompts me to trust Him to direct my growth for the next five years (and beyond) because I can see how perfectly He has done so over the last five. The main sessions of our retreat were on Philippians 2. I was struck by Kay Arthur's unpacking of verses 1 and 2--she explained that we are to take possession of and give to others what we have received from the Lord. She drew parallels I'd never thought of before. The first verse describes four blessings He has given us; the second verse identifies how we can live out those blessings and pass them on to others. The idea here is that God does not ask us to do anything which He has not already done Himself. The Greek word for "encouragement" here is "paraklesis"--related to the Greek word for the Holy Spirit ("paraclete"). It is a comfort beyond mere soothing; it is an encouragement which makes you strong. It is the reassurance of Matthew 12:20--Christ will not break you when you are bruised or snuff out your smoldering flame. He is gentle with us--so we should be gentle with others. We extend to others the patience and encouragement we have received from Christ. The Greek for "consolation" is "paramuthion"--it has the sense here of coming alongside and speaking tender things to you. God speaks His love to us in His Word. In the same way, we are called to speak the truth in love to others--to come alongside them and exhort them with God's Word. The Greek here is "koinonia"--"to share in common." God has given us His Holy Spirit to make us one with Him. Through Christ's sacrifice, and through the gift of the Holy Spirit to dwell within us, we have fellowship with God. And He has given that same Spirit to every one of His children. If all of us who are in Christ have the same Spirit, that unites us. We must not grieve or quench the Spirit--that has fellowship/unity implications. What does the Holy Spirit want to do? Among other things, He wants to love and minister to people--through me. If I resist that--if I do not rejoice with those who rejoice and mourn with those who mourn; if I do not come alongside my brothers and sisters and exhort and encourage them--I am grieving and quenching the Spirit in me. The Greek here is "bowels of mercy"--a sympathy and compassion felt deep in your gut. This is the kind of mercy God has shown us--the same Greek word is used of Jesus in Mark 1:41. He has deep compassion for our helplessness and brokenness--a compassion that took Him to the cross to rescue us. His mercy is new every morning--He never says, "that's it, you're done" to us. The Greek here has the sense of having the same sentiment, being similarly disposed, interesting yourself in, setting the affection on. We must extend to others the mercy we receive from God. How often we are like the unmerciful servant who was forgiven a great debt, but demanded payment from someone who owed him a paltry sum. Instead we are to show others the compassion and mercy that God shows us. Through this study, I loved seeing yet again how God doesn't expect anything of us that He hasn't already modeled. He shows us, perfectly, how to do these things. He fills us with His encouragement, His mercy, His Spirit so that we can pour into others. And He died so that we would receive and understand and be able to live out this grace! How great is our God! "I Want the Things You Just Can't Give Me"
Remember the free Derek Webb CD I blogged about a few weeks ago? Tony Myles created a video for one of the songs, "Rich Young Ruler." It speaks of Jesus wanting the things it would be hardest for us to give Him--as with the title character. The lyrics are challenging--and this video is compelling. Check it out. Friday night, I started with "Praise to the Lord, the Almighty"--the version on Passion: Hymns Ancient and Modern (LOVE that CD). First because all we ever sing at church is hymns straight out of the hymnal. Which are great, but I wanted to change it up a little for the retreat. This worked well because it was still a familiar hymn, so the ladies weren't given all new songs, yet it's a little more modern/updated and fun to sing. Plus, it gave me an easy way to start since it was just singing along with a CD :) I also chose this because of what several of you said about stress/problems fading when you focus on the mightiness of Christ. I agree! I finished Friday night by teaching a simple song that was new to them. It's an old Brooklyn Tab song, I believe, which I learned in chorale when Todd Syswerda was our conductor. Those of you who were in chorale that year...remember how we would sometimes open rehearsal with Todd at the piano and us just singing our guts out? We sang three very simple choruses that year that I have rarely/never heard anywhere else: "More than Enough," "I Want to be Like Jesus" and "Jesus, We Crown You with Praise." How I LOVED those times of worship! In keeping with that theme about who God is, I finished with a solo--Nichole Nordeman's "I Am." It's a beautiful song that emphasizes God's sufficiency for every season of our lives. I didn't expect to make people cry, but several of the ladies had never heard the song before. It has long been one of my favorites! On Saturday we sang "More Than Enough" again since it was new. Then we sang "Count Your Blessings" from the hymnal, because one way to battle stress is to focus on our blessings instead of our problems. Looking back at God's past faithfulness always helps give you perspective and faith for His future grace. And of course, the greatest blessing He has given us is the cross--paying the price for our sins so we could be reconciled to Him. That's the blessing we can place our trust in and rest in. So we sang "On Christ the Solid Rock I Stand" from the hymnal. If I didn't choose one of your suggestions, it isn't because I didn't think it was a great one! I was limited by time, what I had access to, and what I thought the ladies would know. There are so many great songs I wanted to share with them--but I thought it was best not to teach more than one new song, and not to spend a lot of time teaching a harder song. I don't mind learning new songs if they're great, cross-centered songs--but I know a lot of people have a hard time worshipping if they don't know the songs, so I wanted to try and respect that. Anyway, I enjoyed preparing and leading all this, and I loved hearing the voices of women lifting their praises to God, and I pray that He was glorified. Thanks again for your helpful suggestions! *Can I just say how annoying I find it that every one of the major hymn archive websites starts playing obnoxious MIDI files of the song as soon as the page loads, and you can't stop the music? (*cough*CyberHymnal.org*cough*) I purposely chose websites that won't do that to you--some may play obnoxious music but all of the ones linked above at least have a stop button. Also, can I just say how annoying it is that most websites with song lyrics have four hundred popups that somehow make it through my popup blocker? Before choosing music for the retreat, I tried to think about stress from a gospel perspective. I think that at its root, stress comes from trusting ourselves. We have been trusting in our own ability--and we become stressed and anxious when suddenly we realize that our strength is insufficient. We can't accomplish or handle what needs to be done. So I think part of the answer to stress is to humble ourselves, to acknowledge that we ARE helpless. We ARE inadequate for the tasks/trials/etc before us. When we look at the cross, we can see what our best efforts amount to. But we serve a sufficient Savior. He completed the work God gave Him to do--He alone accomplished the awesome feat of reconciling us to our Heavenly Father. We trust Him, not ourselves. And, if we live dependent on Him, instead of in our own strength, He is the one who gets the glory! I'm off to the women's retreat...if you think of it, pray for me as I lead music tonight and tomorrow morning! 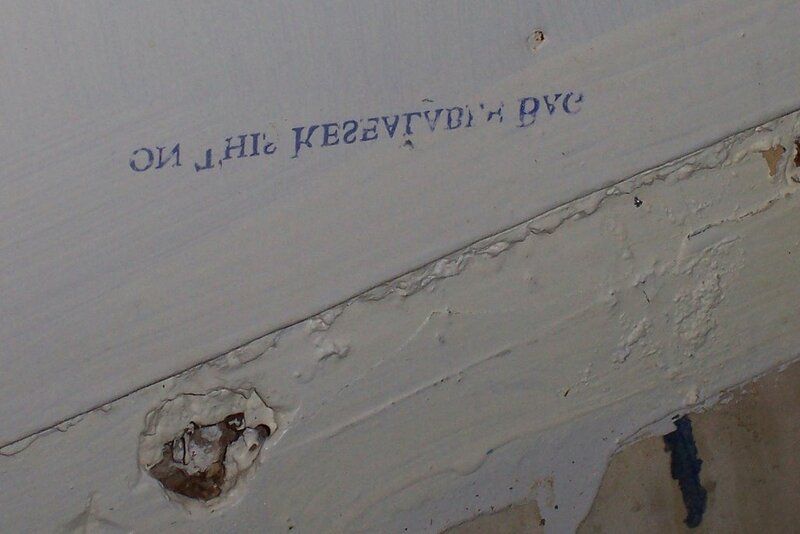 When we tore out the vanity, we found small, strange letters stamped on the wall behind it. It almost looked like Russian to me. Fascinated, I snapped a picture. After uploading to the computer, I rotated the picture and discovered that it actually says "ON THIS RESEALABLE BAG"--upside-down and backwards. On what resealable bag? What goes on the bag? Mystifying. I submitted it to Found Magazine. In the process of working on one of the windows in our bedroom over the weekend (all the windows in our house are painted shut...so we spent Saturday finally tackling the first one, which involved removing the storm window and the bottom window, stripping paint and sanding, removing broken panes of glass, weatherstripping, etc...have I mentioned how glad I am that my husband knows how to do all this stuff? 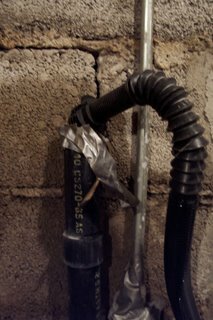 ), we discovered a leak in our basement. Unlike all the other water in our basement coming from outside, this was coming from underneath our bathroom. Steve investigated upstairs and couldn't figure out exactly where the leak was coming from. Monday night, the leak was getting worse, so he decided to move the vanity and dig a little deeper to see if the sink was the culprit. 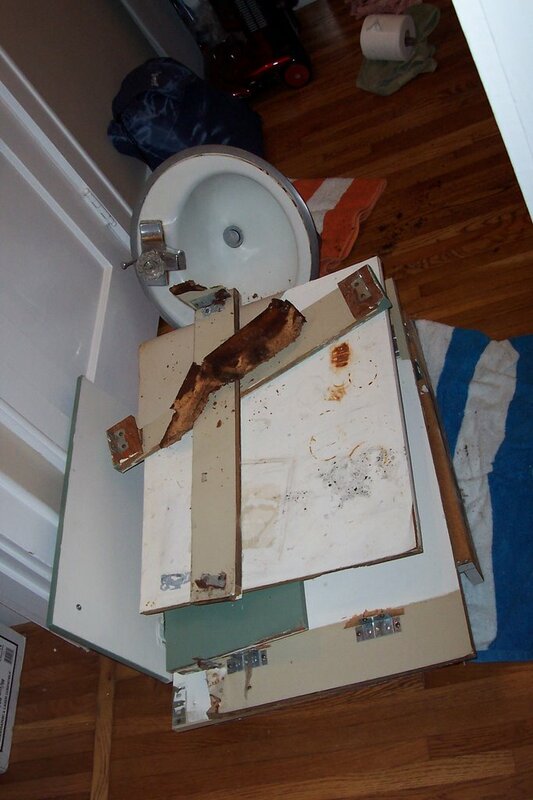 In the process, he discovered that a) the drain pipe was so corroded that when he tried to detach it, the pipe tore; b) the bottom of the vanity was rotted out; and c) the leak wasn't coming from the sink anyway. Lovely. So he unexpectedly spent the rest of the evening tearing things apart and hauling the vanity in pieces out to the trash. We plan to completely redo this bathroom as one of the higher-priority projects on our list, but are definitely not ready to tackle that right now--among other reasons, it is our only bathroom in the house, so we would like to put in at least a working toilet and shower upstairs before we remove the only working toilet and shower in the house. At any rate, we figured that if we bought a small vanity now, we can still use it for the as-yet-nonexistent upstairs bathroom after the downstairs bathroom gets redone. So we headed to our favorite place (riiiight...never mind the terrible customer service that we're dealing there with related to our originally-ordered-August-5-but-still-not-here basement door) and bought a new vanity and faucet. A box fan is going 24/7 to dry out the bathroom (even the wood lath is soaked at the bottom of the wall) and we are using the kitchen sink for all sink needs until further notice. The leak seems to becoming from the shower, as water was running along a nice channel where the shower wall wasn't well-attached to the tub and trickling down the side. Steve caulked it but that didn't seem to fix the problem...more troubleshooting and home repair to come. 5:15ish: Five boys are the first trick-or-treaters. They knock on the storm door, then open it and knock on the big wooden door, then discover the knocker and try that. All in the 20 seconds it takes me to jump off the couch and walk to the door. Four of them are not even wearing costumes, which I think is completely lame and hardly deserves candy, but their parents are waiting on the sidewalk and I'm not mean enough to give them more of a hard time than saying, "C'mon, where are your costumes?" as I dump Kit-Kat bars into their pillowcases. 5:20ish: Steve begins unexpected demolition in our bathroom. 6:15ish: We sit down to taco salads. Yum. 6:30ish: One little girl trick-or-treating. Also delightedly discovers the big, loud knocker on our door. 6:40ish: Steve gets into the candy BEFORE I DO. Shocking, I know. 8:00: We give up on the trick-or-treaters and each grab a caramel apple sucker, then head to Lowe's to buy a new vanity, a new faucet, and some plumbing gadgets to repair the drain under the bathroom sink. 10:00ish: I discover how the length of my bathroom routine gets multiplied when I am making seventeen trips back and forth from the bathroom (where all my stuff is) to the kitchen (where the only sink in the house is). This is the second year in a row that we have had a pathetic number of trick-or-treaters, leaving bags of candy lying around our house. Not good. We live in a densely populated area...I really don't understand what the deal is. Last year at the apartment we had the same issue, but I thought being in a house in the middle of town would make a difference. I guess the neighbor kids behind us, as well as my GEMS girls tonight, are going to hit the jackpot with a bunch of candy so I don't eat it all myself. More on the bathroom repair, with pictures, later. You know you just can't wait.